During the summer, Colgate students are applying their liberal arts know-how in a variety of real-world settings, and they are keeping our community posted on their progress. 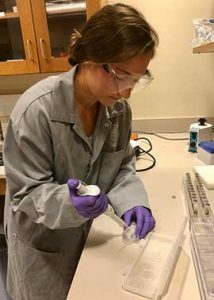 Lindsey Wiley ’20, mathematics and physics double-major from Vienna, Va., writes on her summer research with Associate Professor of Physics and Astronomy Beth Parks, analyzing air pollution sources from Uganda. Because of rapid urbanization and industrialization, air quality in Uganda continues to deteriorate and is reportedly at unhealthy levels. In 2016, Professor Beth Parks researched Ugandan air quality and found extreme pollution in multiple locations. Although the World Health Organization advises immediate intervention when pollution levels exceed published guidelines, it is difficult to take action if the direct sources of the pollution are not known. Therefore, through a source apportionment study of air pollution samples, we aim to quantify the amount of each element present on filters and relate the chemical components to various sources, some of which may be biomass combustion, traffic, dust, etc. My research project deals with elemental analysis of particulate matter — a combination of suspended solid and liquid particles found in the air. Specifically, I am analyzing particulate matter with a diameter less than 10 micrometers (PM₁₀), a notable cutoff because particles of this size are inhalable, reside longer in the atmosphere, and can be transported far distances, further increasing threats to human health. I have been using total reflection x-ray fluorescence spectroscopy (TXRF), which works by exciting inner orbital electrons via an x-ray radiation source, creating a transition in energy levels in the atoms. As a result, the atoms eject photons, known as a fluorescence, which is characteristic of the atom present in both energy and wavelength. We are then able to quantify concentrations of various elements in our prepared samples. The majority of my research has been spent developing as well as testing methods to assess quantifications of each element present in the Uganda filters. We have encountered many challenges, specifically with the detection of silicon, which we expect to account for a reasonable amount of the air pollution. This setback prompted me to reach out to various professors at other institutions, and the collaboration has been very worthwhile. Multiple professors suggested switching from preparing my samples on quartz discs to using sapphire discs, which don’t need to be siliconized, and we were fortunate enough to borrow some from Bruker, the manufacturer of our TXRF machine. After preparing my samples on the sapphire discs, I still had not been able to detect silicon, which impelled me to reach out to the staff at Bruker to ensure my analysis methodology was sound. I began collaborating with an application scientist for Bruker in Germany who was unable to explain my incomplete results. Although this setback has been frustrating, it has motivated me to continue the search for new methods to analyze the samples. Obstacles such as these have been very humbling throughout my research experience, reminding me of my goal to learn from the journey rather than simply come to an end result. It is inspiring to feel that there is always something new to learn, if I am first open to the potential of failure. This mindset will be helpful for future course work and beyond as I strive to maintain an open-minded approach towards reaching my goals and applying my hard work in a science-related field. I have been very grateful to witness the direct application of physics to the betterment of human health through this project and am hopeful to continue work like this in the future.